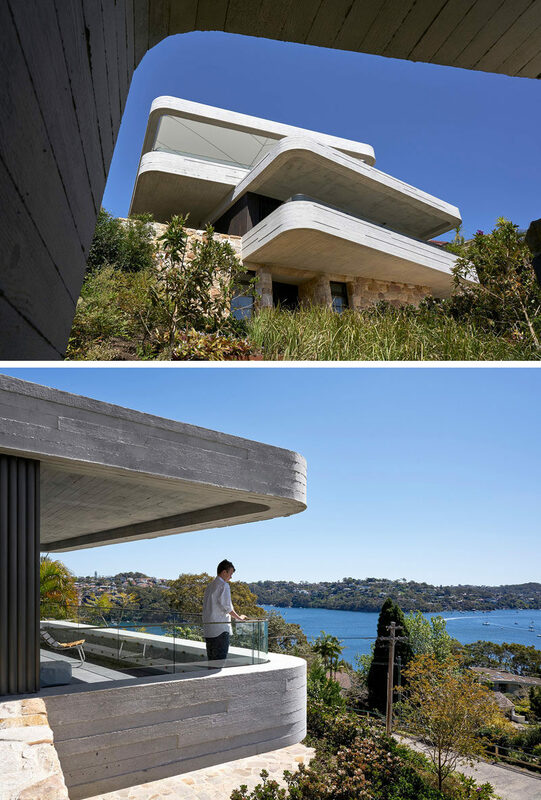 Luigi Rosselli Architects have recently completed a new house in Sydney, Australia, that has a design inspired by a pile of books on a table. 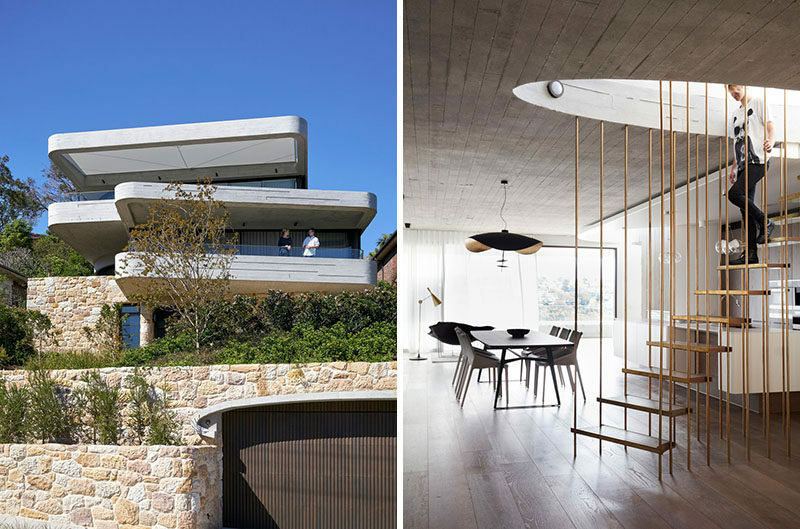 The ‘layers’ of the house are reminiscent of a stack of books, piled up on a ‘table’ of sandstone. The sandstone that’s featured on the house was excavated and quarried from the site and later chiseled into shape by the stone mason. A path winds its way through the garden, and steel edgings help to contain the gravel and sandstone steps. 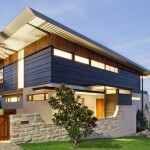 At the top of the path is a patio and the front door that’s surrounded by sandstone walls. 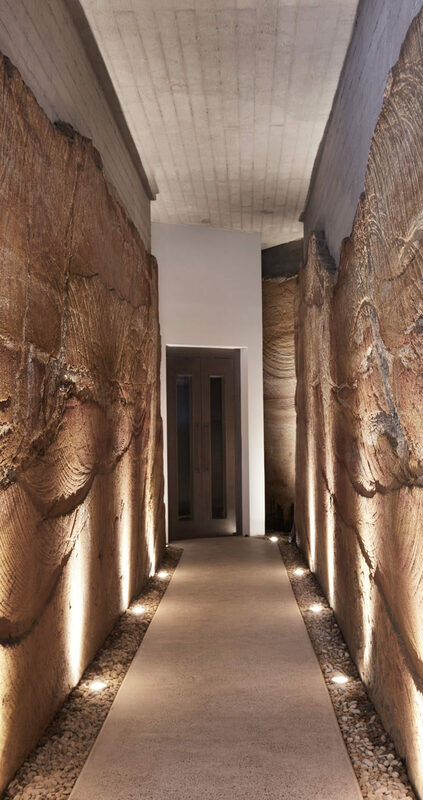 The home also has a tunnel that runs through a sandstone cut corridor that leads from the garage to the stairs (and lift) inside. 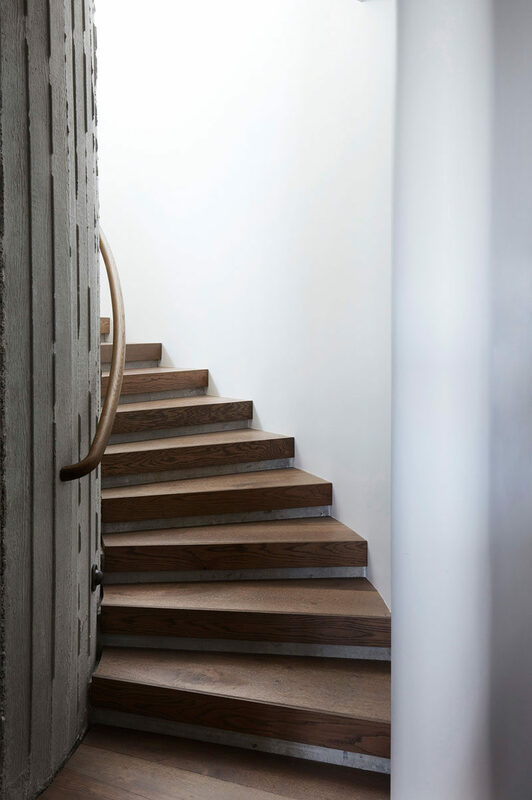 Inside the home, there’s a stairwell that’s shaped like an elliptical and has stair treads made from oak. The stairs lead up to the first floor of the home and opens up into an oval hallway. 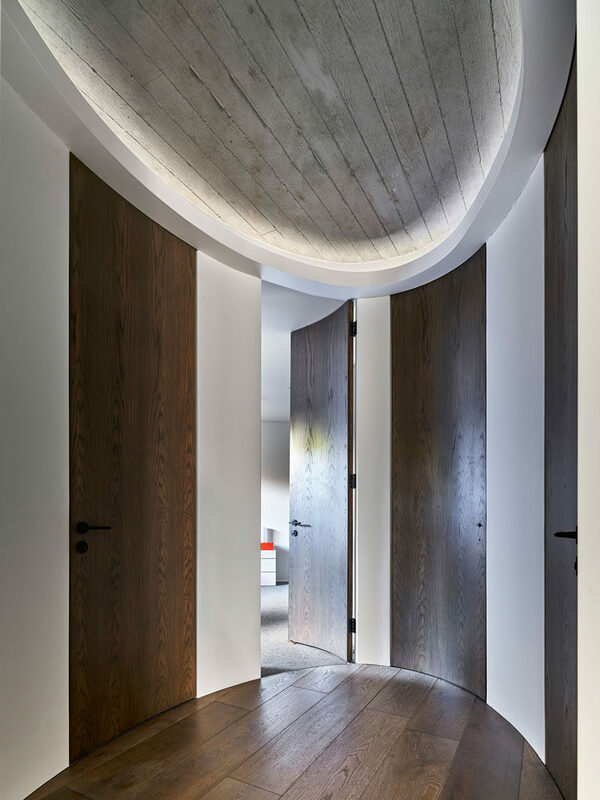 Custom, full-height, curved doors lead to the bedrooms and bathrooms. 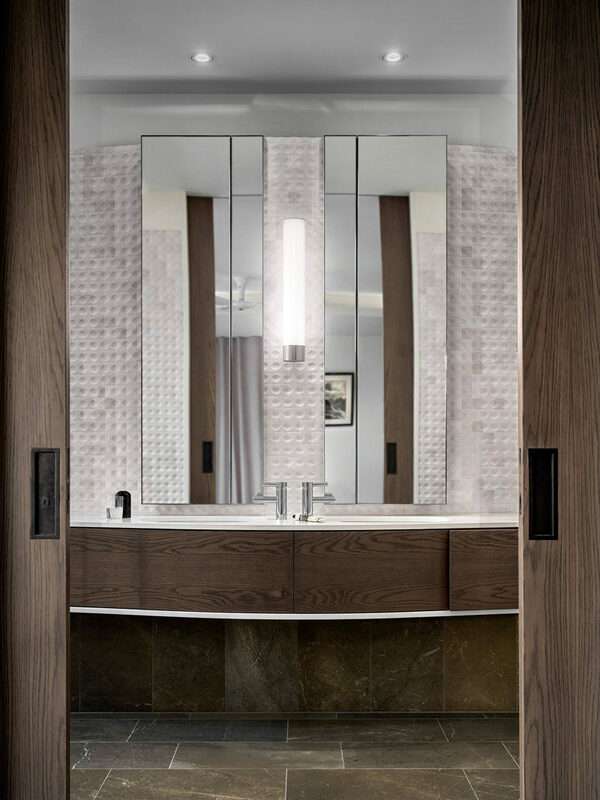 In this bathroom, a custom wood vanity is a strong contrast to the white marble tiles, while the mirrors make the space appear larger. 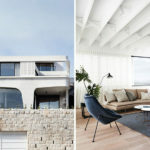 The living, dining and kitchen are all located on the second floor of the home. In the living room, there’s a curved detail against one wall that houses the fireplace. The board-formed concrete on the ceiling reflects the smoked, limed and brushed American Oak flooring. Behind the couch in the living room, there’s a hidden door within the bookshelf. The hidden door leads to a private study with even more bookshelves. The study has a view of the ancient rock shelves and ledges that emerged in this steep escarpment, as well as the pool. At night, there’s a clear view of the study from the outdoor areas. 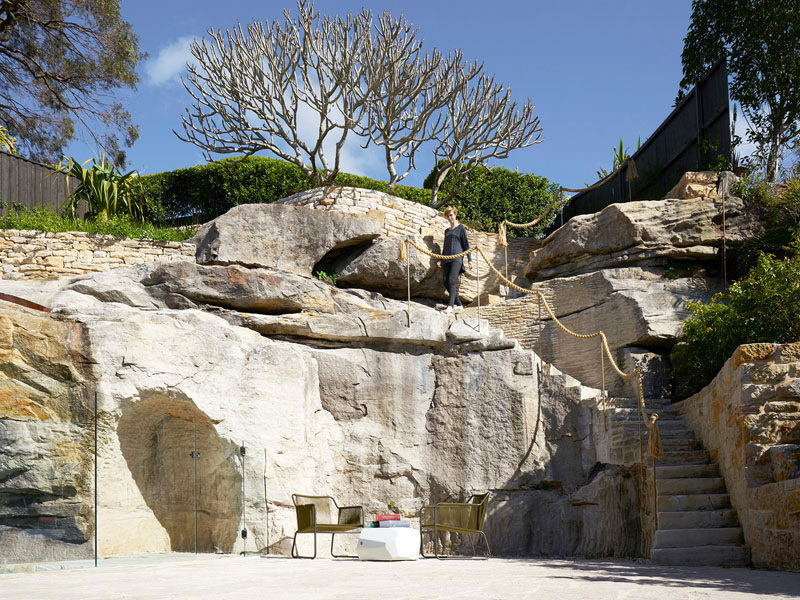 Outside, a pre-existing Frangipani tree is located at the top of the cliff, so a stonemason cut a staircase into the rock to connect the terrace with the top of the garden. Back inside and near the living room, there’s another pivoting that hides the powder room. 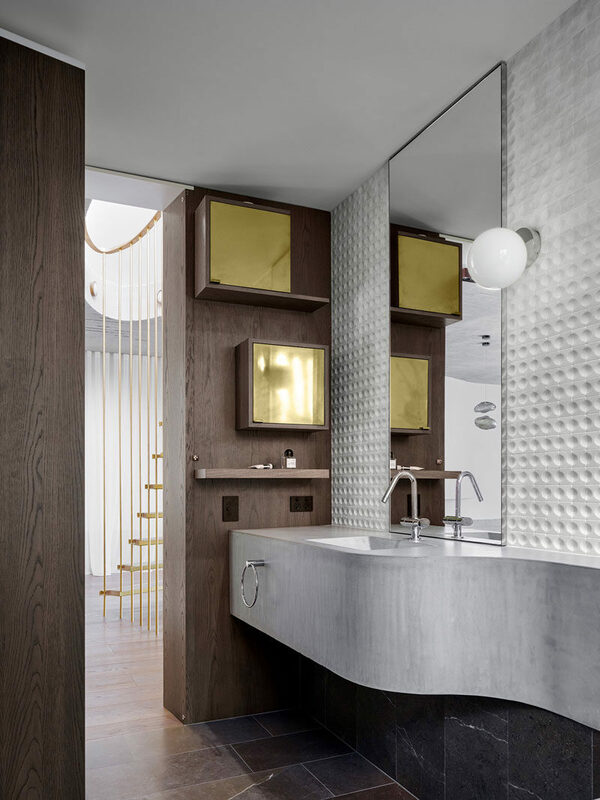 A curved concrete basin and bench creates an interesting sculptural detail in the bathroom. Minimalist brass stairs that lead to the roof act as a subtle divider between the dining and living room and it partially screens off the kitchen. 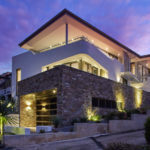 At the top of the stairs there’s a steel door with a glass panel that provides access to the roof and acts as a skylight that provides daylight to the living room below. 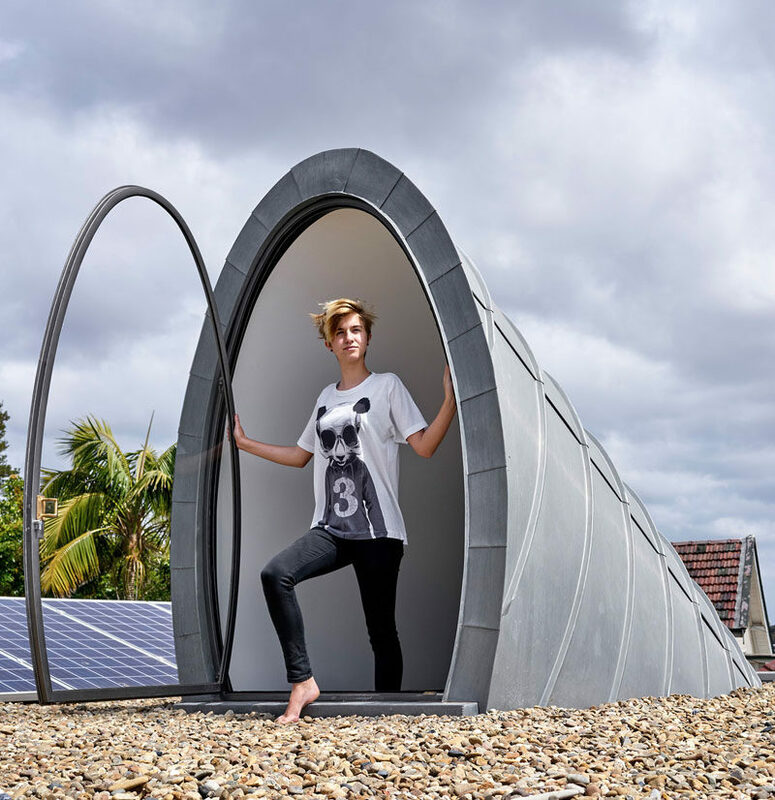 On the roof of the house there’s a solar machine with PV panels, solar hot water units and solar pool heating.